Many academic studies looking at contract cheating think about this only from the point of view of this being a way for students to get essays, terms papers and assignments written for them. The reality is that the definition of contract cheating extends much more widely than that. As part of wider work, I’ve recently been looking a lot at exam cheating and there are certainly mechanisms that are easily available for students to use to pay a third party to attend an examination for them. These slides, originally presented at the CSpace Conference devoted to teaching and learning and held at Birmingham City University look further into the issues about how third parties can become involved in the exam taking process. The slides from the exam cheating presentation include examples of cheating seen in agency sites, as a spin-off to the work that essay mills already offer and on online classified sites. They also look at the people being paid to held students with exams through advances in technology. There’s a whole murky underworld of exam cheating going on through students who have the money and this continues to be an area that needs research and practical solutions. This is the final part in a 10 part series looking at how contract cheating has changed since the term was first publicised in a research paper and presentation in June 2006. As I’ve explored throughout this series of blog posts looking at a decade of contract cheating, the world in which students are using assignment writing services and consultancies has changed substantially. Although it often seems that the push for universities to seriously tackle contract cheating is media driven, there have been substantive pieces of research completed in the contract cheating field. This post identifies 10 research findings which are of particular interest to researchers now and which should inform the next decade of work in this area of student cheating. One of the most interesting findings in the first contract cheating study that Robert Clarke and I published, was that very few students cheated as a one-off activity. We noticed the behaviour that students had successfully made several requests to outsource their work, sometimes with multiple assignments for different subjects being completed at the same time. Recent media reports looking inside essay mills have also noticed the same group of students appearing again and again. Other media reports speaking to essay writers have also stated that there is a personal continuing business relationship between the writer and the student. The traditional academic research into student cheating suggests that student cheat due to desperation, because they don’t know how to complete the work, or because they don’t have enough time. All of those issues may be enabling factors for student cheating, but it appears that once students have found that cheating has granted them academic success, they will continue to cheat. There are cheating networks now, where students refer other students to writers. The growing awareness of these essay writing services around students is leading to their continued growth. One proposal to combat contract cheating that has been made is for the assignment details to be released to students very late, so as to give them little time to secure a worker. Melisa Wallace and Philip Newton investigated how long the likely turnaround times on visible contract cheating sites and found a group of people ready to take on an assignment with either a week’s deadline or even 24 hour’s deadline. They even found that over 10 such workers would be available to choose from for each such assignment. For workers for whom academic writing is their living, being responsive to market needs is important. Other essay mills also regularly advertise that same day turnaround for assignments is possible. They can do this as they have access to their own army of freelance writers, usually consisting of far more people that they actually need. They people are trained to turn assignments around quickly, following the formatting and layout norms for that academic discipline. Our own observations of contract cheating agency sites have seen requests to hire workers in advance, so that these workers are online and available at the time that assignments are released. This is particularly the case for take home examinations. The recommendation has to be that “just in time” release of assignment details is not the right option and may actually create more problems with allowing students to do their best work in this area. There is a traditional viewpoint that original essays purchased from third party sources will be of low quality, particularly since the essay provider has not vested interest in turning out high quality report. Several studies of around ten years ago went along with this viewpoint, showing examples of work purchased at premium prices, but received marks around the pass threshold, involving some failures. The more recent studies about the quality of student work have counteracted that viewpoint. A study by Lisa Lines saw the purchase of multiple essays from different providers, at both undergraduate and postgraduate level. Although the marks awarded for completing essays with the same title varied across providers, she identified essays receiving exceptional marks (above 90%), with few failures. She also found that the work at undergraduate level was generally better than the work at postgraduate level and that the providers who charged more generally returned higher quality essays. During our own research, we’ve seen examples of essays, reports, programming assignments and other pieces of work produced by different academic writing firms and directly commissioned from writers. The standard has been variable, but the work from major providers also seems to have improved in recent years. This is likely largely due to increased education between firms and writers about how high quality academic work should be presented. It also appears that there may now be more internal checking included in the academic commissioning process. It also seems that the quality of the work is dependent more on choosing the correct writer, rather than the amount being paid. It is possible to commission writers directly through contract cheating agency sites. Working with a motivated writer, perhaps through setting them a question that differs from run-of-the-mill assignments, can be engaging for them. Direct communication with a writer can also keep the prices down. Although I don’t have a budget to directly commission work from writers and assess how good this is, I am certain that a high quality 2000 word assignment could easily be purchased for $100 USD or less (and earlier in this series, I’ve demonstrated that offers exist to complete work for as low as $20 USD). During our early studies, we identified that most assignment requests on the EssayBay site were from the business discipline. That finding has been supported many times since. Several academics in the discipline have told me that they believe that there is a real problem in business. I’ve also spoken to a writer for an essay mill and he was very quick to tell me that business assignments and term papers ranked at the top of the more requested list. I often joke that we are turning out people equipped to work in business, as they understand where they should invest money. But clearly, contract cheating in any discipline is not a behaviour that we want to encourage. In the assignments we’ve seen, requests for MBA work and MBA dissertations are appearing with alarming frequency. These are often needed as a professional qualification, can be taken online and don’t appear to have the same level of supervision as other types of qualification. When Neil Wellman and Julia Fallon seriously investigated cheating in an MBA module that they were responsible for, they were able to identify consistent cheating rates of around 30%. The students estimated that around 40% of the work on the MBA was purchased, although that number could not be verified. One student even confidentially admitted that he had given the assignments to their cousin to complete the work. It may soon get to the stage where MBA holders have to be able to demonstrate that their qualification is, indeed, a reputable one. Another interesting research strand that has begun to emerge has been looking at the people who are completing work for students, the techniques that they use and why they engage in this behaviour. A key finding, backed up by my own investigations into the people bidding to complete work for the students, is that this is purely a financial arrangement. The work can be well paid, particularly in economies where the cost of living is lower. There is a lot of work available. The hours and working arrangements can be flexible. As I’ve outlined in previous talks and post, academic writing work is now seen as so lucrative and in demand that people will pay to get access to writing work opportunities. There are whole communities set up to help academic ghostwriters perform better, work more efficiently and avoid the fines imposed by essay writing agencies. Several sources have found ghostwriters who are in this field for revenge. Shiva Sivasubramaniam, Kalliopi Kostelidou and Sharavan Ramachandran identified a community of international writers with qualifications from western universities, but who had resorted to academic ghostwriting due to a lack of work experience. A media investigation found a UK based tutor who had been unsuccessful at gaining an an academic position, so was now supplementing tutorial work by writing assignments for students. My own research has seen plenty of workers on outsourcing websites offering to complete academic work and advertising academic qualifications up to PhD level as their credentials. I have spoken to online writers and found a mix of ethical views towards completing student work. Many writers say that they are happy to complete academic work for students, as they see this as fulfilling a market need, but ethical boundaries vary. One writer said that they were unwilling to help prospective nurses, for example, but would happily turn out several business essays a day if sufficient work was available. Christopher Harris and Padmini Srinivasan went further and created a fake website offering homework help services. They found that most workers on a micro-outsourcing site were willing to allow their answers to be submitted by students for academic credit, most significantly when the worker was from India or Bangladesh. They also found that the size of the payment made to the workers did not change their ethical views on this topic or whether they would accept work offered as providing contract cheating opportunities. These workers were either already willing to support student cheating, or they were not. The growth of individual writers advertising contract cheating services on social media and the more aggressive and the targeted nature of this advertising suggests that workers are now seeing the benefits of setting up their own direct provision of essay writing services. There are all kinds of involved marketing methods that students can now use to attract students. I predict that the number of people who are using academic writing as a major source of income, or looking at this as their career, will only grow further. One of the biggest surprises to me during the 10 years of contract cheating research that I’ve been involved with, is that no-one has made substantial progress towards the problem of writing software to identify when contract cheating has taken place. My own research publications have identified several possible models for this, ranging from suggesting stylometric analysis to look for a student writing style that differs from what would be expected, to developing intelligent systems designed to monitor the requests posted on contract cheating websites and attempt to alert the owners. I have seen some initial findings of promise, including some unpublished work suggesting that there are elements of student writing styles that can identify them, even with a small writing sample. But, there has not been interest shown by funding bodies to take this work to the next level and no computer scientists or linguists have taken this on as a personal project to challenge them. Likewise, none of the major plagiarism detection services have looked to add this type of detection to their services, preferring instead to stick with releasing traditional text matching software. One surprising result that I have found during my investigations with Robert Clarke is that running requests for assignment help found online through Turnitin can sometimes help to identify the source, particularly where academics reuse the same assignment briefs year after year. Likewise, student work can often throw up indicators that all is not what it seems, particularly through small percentage matches to external sites. Not all ghostwriters provide work that is as original as they advertise and several students have been caught out when their writer was found to have taken shortcuts. Contract cheating detection would be an excellent area for PhD students to get involved with. There’s scope for multiple PhD projects in this area as there are many different approaches that can be investigated. There is a timeliness for this work and so opportunities to make an impact during and beyond the PhD. This ties in with trends of national and international interest. My own PhD developed software to solve the more traditional problem of detecting plagiarism, but I would be keen to work with PhD students looking to develop methods, metrics and software for detecting contract cheating. Very early on in our contract cheating research, we identified the pattern of certain accounts that were requesting that vast volumes of assignments were completed for them. These were often across different academic disciplines, involved multiple years of study and even covered assignments from several universities. What we identified were third party subcontractors, essentially people or businesses who took in orders from students and then themselves used an outsourcing process to find workers to complete the assessments. Over the past decade, that third party subcontractor model has become more commonplace, with many of the larger essay writing companies using a similar process. The main difference here is that the continued outsourcing process is often kept private inside those sites and only seen by registered writers. For smaller companies, for instance those single-person companies operating within a local area, or targeting students at a particular university, cheap outsourcing to traditional agency sites such as Freelancer still exists. Sometimes, this can be done by individual writers who simply do not have the capacity to complete all of the orders that they’re receiving at busy times of the academic year. During the continued student work outsourcing process, the latest observations are that these third party subcontractors often have a group of regular workers that they use, continue to manage and put their assignments through, all protected through the privacy and escrow payment process in place at these outsourcing websites. Writers have indicated that as little as 10% of the money paid by students to essay sites may end up with writers. The real money in the essay industry is clearly taking in the orders, not completing the writing. Likewise, the students who are now identified as going directly to writers rather than through other companies have also clearly identified how to get the best return for their academic writing investment. One of the most interesting of the contract cheating studies that I’ve read about over the past decade was an investigation by Dan Rigby and team into how much willing students would be to pay to outsource their assignments. They completed this study using standard proven economic theories. They identified that over 50% of students would be willing to buy original assessments from ghostwriting services, with a clear reduction in numbers if the risk of being caught went up. Increased numbers would commission work if the quoted price was lower or the likelihood of receiving a top grade was higher. It is still difficult to ascertain exactly how many students have used contract cheating services, as only a small number of students get detected and taken through formal disciplinary processes. I’ve seen small scale estimates suggesting that this number could lie anywhere between 1 in 100 and 1 in 2, depending on the students and discipline. I suspect that the real percentage of students who have tried using contract cheating services is closer to 10%, although this will vary between cohorts and academic disciplines. In any case, the number of students contract cheating must be sizable, as the latest estimates suggest that a minimum of £100 million (GBP) a year of business is working its way through these sites (although my own studies suggest £20 million as a more immediately believable figure). Much media attention has been paid to the likelihood that international students are involved with outsourcing their work. A Freedom of Information Act request in the UK found that international students were three times more likely to be caught cheating than home students. A media investigation in Australia went inside an essay mill aimed at students from China and found that many made prevalent and repeated use of this service. When Dan Rigby and group investigated which students would be willing to pay for assignments, they found that around 75% of students with English as a second language were willing to buy assessed work, as opposed to 50% of the general student body. When non-international and international students work in teams together, there have been several online discussions where the non-international students have reported pressure from the international students to use academic writing services. There are many indications that suggest that the use of contract cheating providers is common across that group. We need to be aware that international students are particularly susceptible to the marketing of contract cheating services and identify how to best support those students and ensure that they do not end up tempted to use essay writing services. If we can dream up an assignment, students can find a way to either cheat on that assignment, or to give themselves an unfair advantage. I’ve often given talks and heard academics talk about their “unbeatable” assignment. For instance, they require students to complete work in stages, each of which receives feedback and is sent back to the student for improvements. Assignments like those are just as easy to outsource as any other. We’ve seen plenty of examples online of students securing workers to complete their project work, with the workers being sent the feedback comments as they come in. If anything, this makes the workers life easier, as they get the benefit of the feedback intended for the student. What we can do is avoid setting the type of standard repetitive essays that are many writers bread and butter. The writers eagerly await the essays on standard themes that they can turn around in a few hours. Many of the more challenging and unusual assignments are harder for students to find a worker to complete for them. Although this is the final post in this series on contract cheating, you can be assured that coverage of this problem will continue on my blog, through my teaching and learning presentations and as part of my wider media and research work. The problem will not go away. New cheating developments will continue to emerge, as a small group of students continues to look for new ways to earn qualifications that they do not deserve. Do take a look at the other parts of the 10 in 10 contract cheating series and let me know about any areas of student cheating that you’d like me to focus in on, or to direct other researchers in the academy integrity field towards. As always, I’m happy to be contacted regarding keynote speaking opportunities, research collaborations, training sessions and other consultancy opportunities around the field of contract cheating. This is post 9 in a 10 part series looking back at contract cheating over the past 10 years and how what we know about this type of cheating has developed. Many of my feelings about contract cheating over the past decade have been captured in a keynote presentation I gave at the Western Australia Forum for Contract Cheating, which was held at Curtin University in Perth Australia. It’s all pleasing to see the messages behind contract cheating being taken seriously and the sheer interest in this presentation was incredible. Participation included many major contract cheating researchers from Australia and the message that contact cheating was not something that we want to see clearly resonated. There was also media interest in the presentation. I used the keynote presentation to position contract cheating within a wider context, including looking at the similar cheating behaviours that existed before widespread use of the Internet. I also considered the messages that we need to think about in the future world of fair and accountable assessment of academic skills. The video recordings from the full forum are available here (including my keynote). There were some really interesting presentations of work in progress, including looks at how to profile students in danger of contract cheating through their marks, the legal issues of contract cheating, how cheating groups had been set up to “defeat” business simulation assignments and even the pre-workshop discussion I gave for Curtin University staff. You can also see a Storify discussion of the social media discussions around the contract cheating forum here. Definitely a worthwhile event and hopefully the first of many in that part of the world. Future contract cheating events certainly have my full support. Take a look here to check out the other parts of the 10 in 10 contract cheating series. This is the eighth in a 10 part series looking at how contract cheating has changed since the term was originally introduced in a research paper and presentation in June 2006. As I’ve explored elsewhere on my blog, within my teaching and in other talks, understanding social media is now a core part of many jobs. For students, social media is part and parcel of their life. We’re working with a generation of people who are always switched on to the Internet and wider online developments. We’re also dealing with a set of social media properties that are in flux. Where once Facebook may have been the order of the day for students, now alternatives exist that are visual from the outset, such as Snapchat and Instagram and many students engage with emerging social media that academics have barely begun to consider. As I discussed in the video, examining the marketplace changes in how contract cheating services are promoted, essay writing services have now begun to develop full sales funnels and processes to encourage students to use their bespoke writing provision. As has happened in so many other industries, social media is now a key part of that sales funnel. This post looks particularly at the enhanced role that Twitter now holds in helping students to cheat. I’ve chosen Twitter as I’m an active Twitter user, but you’ll find similar examples of contract cheating marketing developing on Facebook, LinkedIn, YouTube and other social media networks. In this post, I’m going to look initially at the traditional types of accounts that exist on Twitter for essay writing services. I’m going to follow this by looking at the changes in the market and the emerging ways in which Twitter is being used to market services that provide essays and assignments. The are many examples of contract cheating services with Twitter accounts. The image below selects just three services from around the world that are typical of traditional social media marketing. These accounts are all used in what I would consider to be a standard social media marketing manner. They tweet information of interest to students, provide details of their services and show positive proof to customers such as testimonials. The frequency of tweets varies. One of the essay mill Twitter accounts has 5,950 followers. The other two selected have 854 and 905 followers. These are not untypical sizes for the number of followers, although there are many Twitter accounts for essay writing companies with fewer followers. 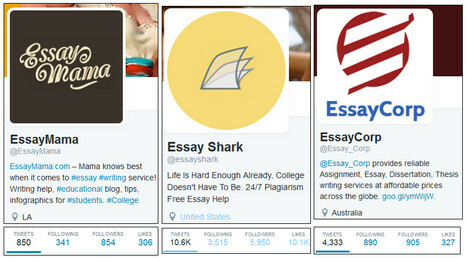 Using a quick search for the word “essay” in Twitter accounts and manually filtering these to accounts aimed at writing essays for students, I quickly identified 28 such company accounts, including several presenting their services as consultancy. However, a search for “UK essays” identified 41 such accounts, with very little overlap between the two lists. Some of the UK accounts are clearly local adverts for international companies. For instance, I saw one account with UK in its name, but with pricing listed in United States Dollars. There are many other search terms that need to be considered to build up a full picture about the scale of Twitter cheating. This includes searching for terms other than essay, looking for localised accounts and finding subject specific accounts. The sample searches used also do not identify the accounts of individual writers, who may be taking business directly from students who wish to bypass established companies. From this brief analysis, I would be surprised if the number of Twitter accounts aimed at offering assignment completion services to students was below the high three figures. A number above 1000 does not seem outside the realms of possibility. This image below shows an example of a request (which may or may not have been serious) for essay writing help on Twitter and shows the public responses that were quickly made. The image only captures replies that were made in public. There’s no telling how many private offers were made, or no indication if the student took any of these offers up. It is interesting to look at the range of sites offering bespoke essay writing services. There are large companies represented, as well as smaller writers, most likely working on their own. The student also rejected one offer outright (likely from a friend) due to concerns about the grade that would be received. Some of the responses are personalised. Offers look like they may have been automatically generated (perhaps based on a keyword analysis of the original tweet). I identified one company that sometimes looks out for students tweeting requests for essay help or comments that indicate that they are struggling with their essays and then retweets them. Although they do not retweet every day, when they do this, they look for as many requests for essays to retweet as possible. For instance, on a representative day in 2016, they retweeted 8 different people who were receiving offers to write their essay – all tweets made that same day. Those people then received anywhere between 2 and 9 different visible contract cheating offers on Twitter, with a mean number of offers of 5.25. Some of the tweets were sophisticated, including discount codes and offers to enter into private negotiations regarding pricing. It is also interesting that a wide range of different accounts participated in making the cheating offers and they were not just the same accounts repeated each time. 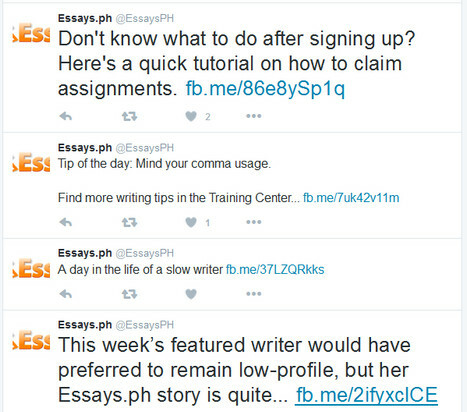 Several essay writing companies now tweet out details of assignments. 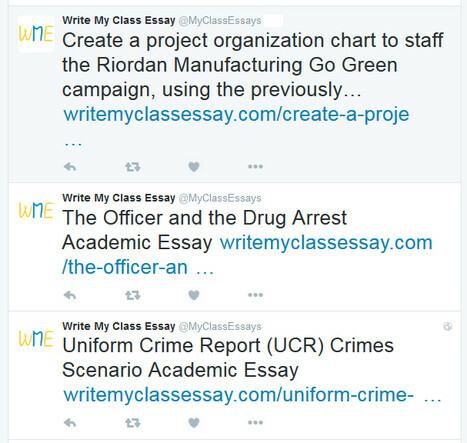 The image below shows an example of recent tweets by one such company, all of which are the start of longer text providing details of the assignments. Clicking on the links leads to a page on the website of the essay writing service, where more details of the assignment are visible – as well as the option for a student to submit a request for a similar assignment. The company indicated has made 16.6k tweets. Almost all of these follow a similar format to that shown in the image. Google has indexed 33.2k pages from that same site. It is not clear if these are the assignments that this company has produced for students, or if these come from a wider database. However, the site itself indicates that they have 18K completed orders, with 80 orders in preparation, a team of 50 writers and 3 live chat operators. The latter number, indicates the focus that this site has on marketing (supported by a live chat that opened soon after I accessed the site). It suggests the competitiveness of this market and the need to provide personal attention in order to generate essay and assignment orders. Some sites are most sophisticated with their automated Twitter marketing. For example, I’ve seen examples where all the tweets are accompanied with images and direct buy buttons to provide even more ways for students to directly buy their assignment from that service. Although there are many Twitter accounts now aimed at advertising different essay mills and encouraging students to visit these essay writing sites, a new trend is the emergence of sites aimed at recruiting and supporting essay writers. This should be of little surprise. The essay industry and large and growing, so a continual stream of new writers is needed. The image below shows an example of one such account with 2024 followers. Many of the tweets link to the company Facebook page, which is presumably where many discussions take place. The page is private and presumably restricted to registered writers. The mix of tips and success stories is there to motivate workers. Their site claims that they have completed 23,260 writing projects. Despite the labeling of the site with the word “essays”, it is not clear if these are all academic in nature or not. The company concerned seems to operate the sites where it generates orders separately. That model is not uncommon. There are other such collections of writers that exist to provide the human resources needed by other essay writing companies. They then just plug into this large pool of writers without needing to manage their own workforce. It’s not clear if the company presented here also provides such a service. The social media promotion aimed directly at current and aspiring writers is growing. There are whole online communities devoted to this, as well as detailed guides and support services helping workers to get accepted with the major essay writing providers. The world of affiliate marketing is an interesting one. Essentially, companies pay people commission to send customers to them. Many services aimed at doing assignments for students now offer an affiliate scheme, for instance, by giving a referrer a percentage of the value of any completed sales. There are whole sites set up now that appear to be reviewing different essay writing providers, but instead are actually being paid when students click through the positive reviews and place an order. The image below shows an example of a site that has moved that affiliate model onto Twitter, and taken it one step further, by focusing on discounted offers made available to students. This particular account is relatively small, with 89 followers, but shows another emerging development in the student assignment industry. The tweets all link to different essay and term-paper writing services. Not all of them contain a coupon code giving students a discount, but presumably all offer an affiliate commission if the student goes on and places an order. As is common now when advertising essay providers, the advertising of the work as being “plagiarism-free” is prominent. Will Twitter Continue To Enable Contract Cheating? The sophistication of essay writing service advertising is growing. Enhanced marketing funnels, both to find student customers and to identify new writers, are emerging. This article has only really scratched the surface on the ways that Twitter is now being used to aid in student cheating. There is much scope for further research in this area, including identifying Twitter accounts, collecting quantitative data and even automatically analysing the language used in tweets to see how successful the marketing methods used are. Due to the huge amount of money in this industry, with estimates of tens of million pounds of businesses going through essay services every year, the attention paid to contract cheating marketing will only increase. The sites that are missing aspects of their marketing used by their competitors will be looking to develop this. I can see a future where companies start to combine together the different Twitter marketing strategies that have been identified in this post. For instance, a Twitter account operating on a referral model and generating commissions, but tweeting higher quality content, could be successful. I can also foresee similar trends moving to other social media services (the world of Facebook and contract cheating is a whole detailed article in itself). 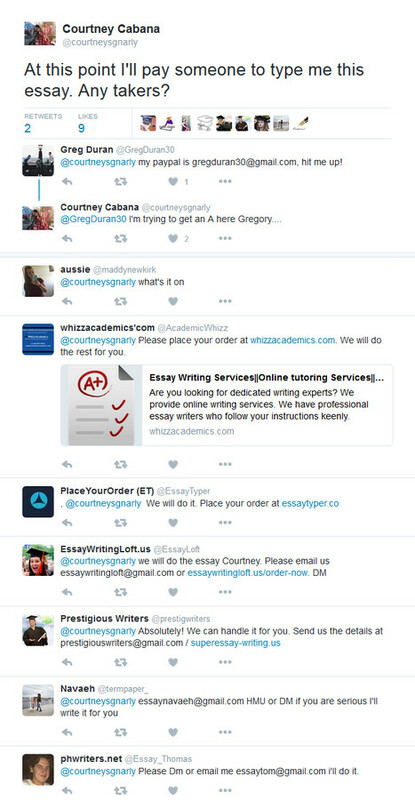 Twitter accounts aimed at publicising the problems and potential poor quality of essay writing services, such as the one in the image below, are beginning to appear. But, these accounts are not prominent. 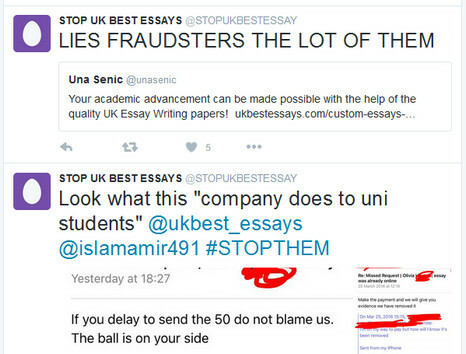 The particular account shown seems to tell the story of a financial disagreement between a student and an essay writing service, with several emails displayed in images. The student was threatened with the work being sent to their department and asked to send more money. It is not clear what the end result of this case was, but highlights a danger of students using contract cheating services. There are also other academics, myself included, who tweet stories relating to contract cheating and who play a role in balancing the heavy marketing push of such services on Twitter. It is clear that Twitter marketing for contract cheating services will continue. There are several reasons for this. 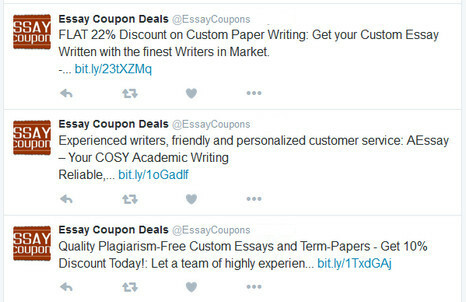 Anyone can market their own essay writing services on Twitter. Or, they can promote the services offered by other companies. And, this social media marketing can be completed without them spending a penny. This is why Twitter marketing is proving so attractive to assignment providing services and academic ghostwriters as the world of contract cheating continues to expand.